I recently went for a job interview, for an Academic Caseworker at a University. I woke up at the crack of dawn, and smiled at anyone I caught eyes with on the train journey. I believed that this job was already mine and that my positive thinking would radiate into the minds of the the interviewers. My heart sank when I found out it was a competency based interview. Neither the less I was determined to answer all the question to the best of my ability and convince them that I was the best person for the job. The next day I was informed that I did not get the job, the reasoning being- I was too creative. I thought this was ridiculous, especially when most job specifications said they wanted someone creative and forward thinking. After spending the afternoon seeking reassurance from my mother, I had a break through. There wasn’t anything wrong with my skills or my ability to do the job, I just didn’t tick a box. It seems that employers have created a generic human being and you must appear to be a blank canvas to get a job. Unless of course, that job is at Google or one of those other internet based business. Continue reading if you are interested in learning how to become a clone. At university we were encouraged to be individuals, but this is not valued in the world of work. No matter what employers say, they want someone who they can turn into a into a living embodiment of their companies ethics/values/goals. You should wear neutral colours or ideally black and white. On a subconscious level, wearing black and white tells the employers that you are generic and can interpret information simply. Make sure that your clothes are clean and ironed. A untidy appearance shows more then carelessness, but a lack of organisation in your personal and professional life. All your favourite celebrities are in fact actors and actresses. Some such as Katie Price, make a career out of portraying a carefully constructed persona. You can to. When reading the job specification, think about who this ideal person would be. What would they look like and what hobbies would they have? I made the mistake or talking about my real five year plan, don’t fall into the same track. Adjust your professional personality to suit your job role. Talk about your desire to progress in the relevant field or wanting to make it better. 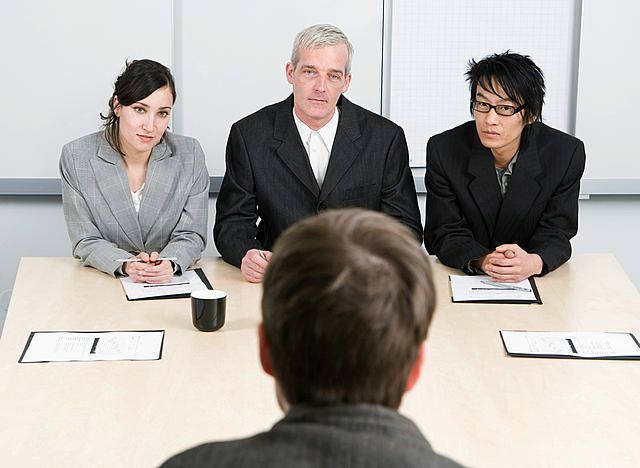 You want to give the interviewer the impression that you could stay in the job forever. Learn how to play the game. At the end of all job interviews they always ask if you have any questions. Always ask at least two questions, so they actually see that you have a brain. These should be specific to the job role e.g what is it like to work within this role. You want to make your interviewer believe that you want this job more then anything in the world. This is called professional begging. Don’t ask more then two questions, as you may come across as a strong person and someone who could possibly challenge your job role/ company. This is a bad thing, you want to appear to be a clone. In most job interviews, they will never directly ask you what you know about the company. It is your duty to incorporate company information into your answers at appropriate times. E.g in my current role I am used to engaging with a diverse range of people, so would enjoy to continue this in a new post. You want to show that you would be a valuable member of the team. Most importantly, that you have taken the time to research the company and care about what they do. This is very important. You are no longer a student so friends and social events should not be your priority. When asked when you can start or if you have anything planned always say no. If you want to attend something during work hours, you can always ask for the time off when you have secured the job. You must show that you are flexible and ready to work. This will be very important when they are making the selection process. These are just some of my tips on how to secure a job and I hope they are helpful to you. In this competitive job market, you must try to mould yourself into the perfect candidate. Save your creativity and originality, to develop your business ideas and possible freelancing opportunities. If you remember one thing from this blog it should be, fake it until you make it. I would add another point: be prepared for surprising and nasty questions.